In this world of phablets, ultra-thin laptops, and wearables, is there still room for an old-fashioned, gigantic desktop PC? If you’re Digital Storm, the answer is yes. No, strike that. Digital Storm’s big, brash, and bold Aventum 3 is more of a “Hells yes!”—and a challenge to the trends of low-end, low-cost, and tiny. I’ve seen a lot of big PCs in my day, and the Aventum 3 is among the largest, if not the largest. It’s so big, it barely fit on our lab bench. It also sports a custom American-made chassis with a sleek custom paint job. The paint job has enough clear coats to make it smoother than a car after Biff Tannen himself put two coats of wax on it. 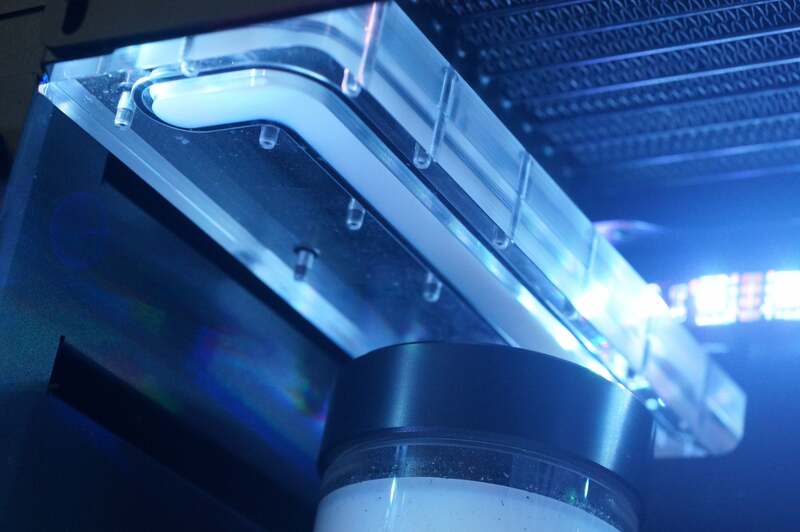 Inside are the latest bleeding-edge parts from Intel and Nvidia, and of course, custom liquid-cooling with unique design flourishes. 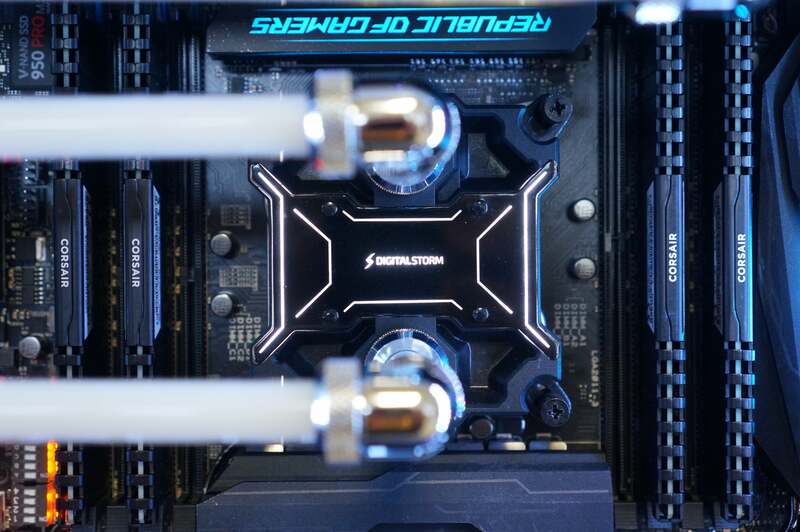 Under that EK water block is Intel’s brand-new (and pricey) 10-core Core i7-6950X CPU. The Aventum 3’s beating heart is Intel’s brand-new Core i7-6950X—a mind-boggling 10-core CPU that has a mind-boggling list price of $1,723. Having such a beefy chip does pay dividends: You get stupidly good performance during both single-threaded and multithreaded tasks. With a combination of higher clock speeds per core and so many threads, the i7-6950X can run circles around Skylake and Xeon parts. It has to be overclocked for that, of course. But since you’re paying for a tricked-out system, Digital Storm has done the work for you. The Aventum 3’s i7-6950X has been overclocked from its stock clock speed of 3.0GHz under multithreaded loads to 4.3GHz. Keeping the Aventum 3’s Broadwell-E processor company are two of Nvidia’s GeForce GTX 1080 cards in SLI mode. Why not three or even four GTX 1080 cards? You can thank Nvidia for Digital Storm’s restraint. The graphics company has essentially washed its hands of supporting more than two GeForce GTX 1080 cards in SLI. We don’t know if that limitation is permanent, but it’s truly sad. For storage, the Aventum 3 relies on a Samsung 850 Pro M.2 NVMe drive. I expected a PCIe add-on card, but that said, the 850 Pro is no slouch. It’s just funny to see such a tiny drive serve as primary storage in such a huge system. You also get a 6TB hard disk drive, 32GB of Corsair DDR4/3000 RAM in quad-channel mode, and a 1,500-watt Corsair power supply. 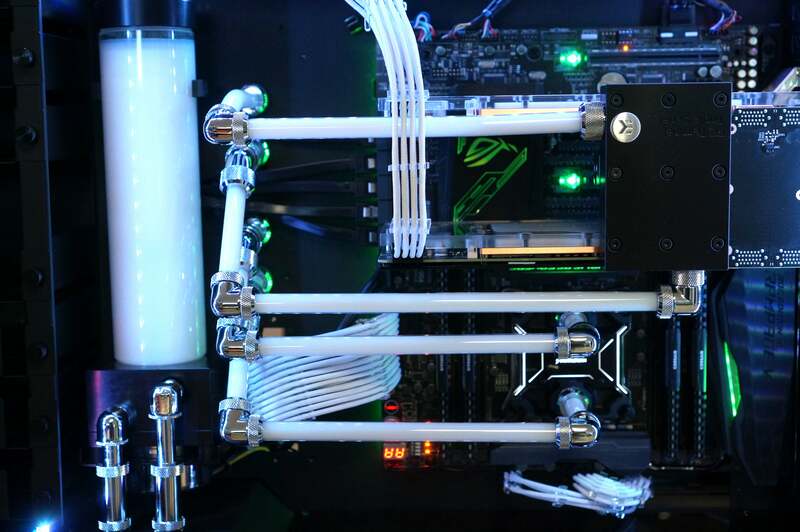 This tower of power is fully water-cooled by a slick custom-loop design built from hardline tubes and chromed elbows. Even slicker: The plumbing wends its way through the case itself, and several of the junctions have been made from plastic blocks. If you’re asking why—well, why not? Could Digital Storm have just used a flexible hose or hard tube here, instead of a solid piece of plastic with channels cut into it? Sure, but then it wouldn’t look this cool. The back of the case also features a massive plastic water block that seems unnecessary for cooling but still looks neat. Speaking of overkill, no fewer than three radiators have been installed in the Aventum 3. You don’t need that many for this amount of hardware, but that doesn’t diminish their contribution to this rig’s badass vibe. The braided power supply cables feature combs to keep the wires nice and tidy. The real star of the Aventum 3’s presentation may be the case itself. Most boutique PC vendors use an off-the-shelf chassis that they mod or paint in some distinct fashion. Or they go to a case manufacturer and ask for a small production run of an existing design with a customized facade. For the Aventum 3, Digital Storm took the fairly unique approach of first designing the case in-house, and then having it built right here in the US of A. That’s right: Team America, f* yeah! Even putting aside the design and manufacturing of the case, and the sweet paint job I mentioned earlier, its enormous size is noteworthy. The Aventum 3’s case is 28.5-inches tall, about 25.5-inches deep, and 10-inches wide. A typical desktop tower might be 20-inches tall. You know you have a serious PC when you have to throw an unboxing party just so you and two friends can get it out of the packaging safely. 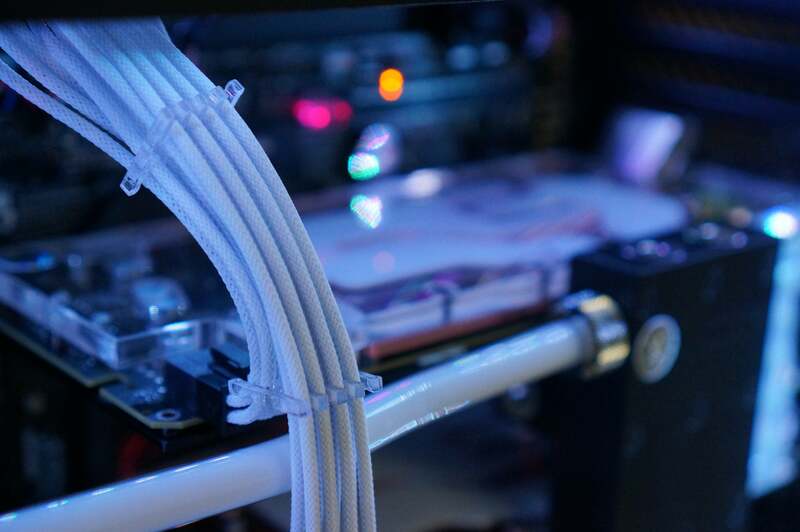 PC fashion tip: Flexible tubing is out and hardline tubing is in. The Aventum 3’s case features some interesting touches, too. 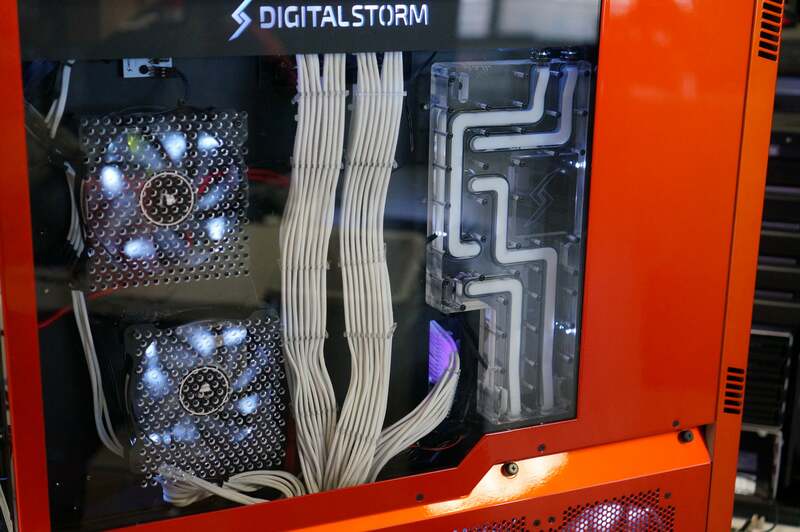 Digital Storm designed it with pass-through for the custom liquid-cooling system using quick connect systems. The company also routes power from the Corsair AX1500i PSU through the case—you just plug the cables into the chassis and into your hardware. It eliminates cables snaking everywhere, and gives the system a sleek look. The upshot is that if you want the Aventum 3’s chassis for your next PC, you have to buy the complete system from Digital Storm. For the person who wants something few others have, that alone may be worth the price of admission. 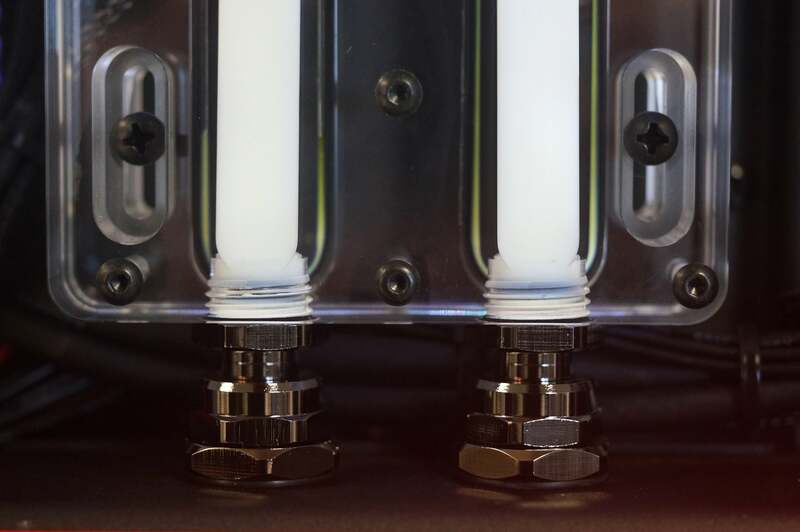 The back side of the Aventum 3 features a window and a nifty plastic block to route the liquid. The wiring is clean, but I have seen better. Enough about looks—let’s get down to how this machine actually runs. 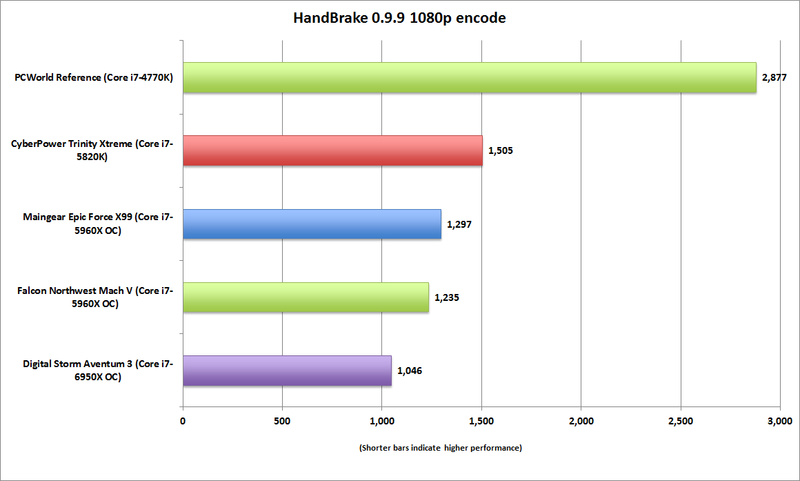 For our first benchmark, we used the popular free encoder Handbrake to convert a 30GB 1080p MKV file using the Android Tablet preset. This program generally loves CPU cores, but it doesn’t scale quite as well with the 10-core Core i7-6950X. The Broadwell-E CPU has so much excess capacity that you can run Handbrake alongside another multithreaded application (or two) without issue. That said, it easily wins against other processors. The quad-core Haswell in our reference system looks pretty moldy in comparison. The Aventum 3’s 10 cores take the top spot, but the 8-core chips in the Falcon and Maingear systems aren’t that far behind. 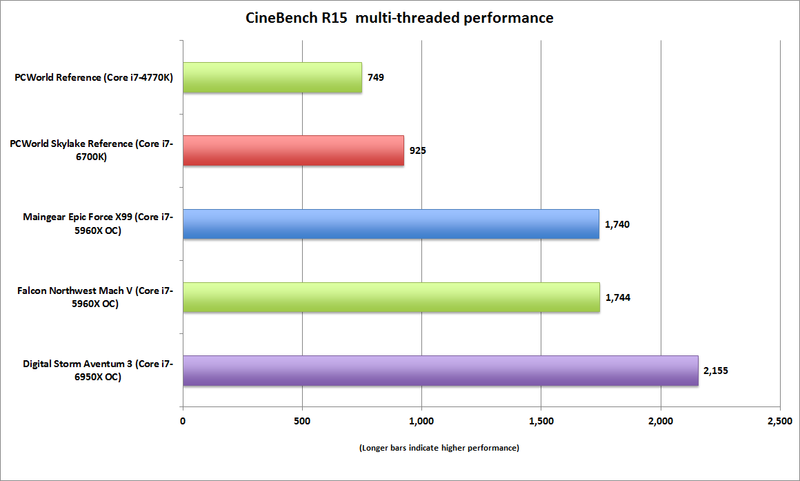 CineBench R15 is a CPU benchmark based on Maxon’s Cinema4D 3D rendering engine. Here we see the i7-6950X take a nice lead over the 8-core chips in the Maingear and Falcon Northwest boxes. All three rigs were running overclocked. I also threw in a quad-core Skylake Core i7-6700K for comparison. Enough about the 10-core Broadwell-E. A big tower with multiple GPUs is very much about gaming and graphics performance. The clash between the Aventum 3 and other mighty gaming rigs is about as epic as you can get: The Falcon Northwest Mach V features three GeForce Titan X cards in tri-SLI, while the Maingear Epic Force X99 does the Mach V one better with four GeForce Titan X cards in quad-SLI. These are the two systems to beat for the Aventum 3’s pair of GeForce GTX 1080 cards. But for further comparison, I also threw in the Origin Chronos with a single GeForce GTX Titan X, and our PCWorld reference system with its lowly GeForce GTX 980 card. Looking at the numbers, the obvious winner is the Maingear Epic Force X99 with its four Titan X cards. The Falcon’s three Titan X cards come in second place, and note the limited scaling you get by moving from three to four Titan X cards. Even with a third-place finish, the dual GeForce GTX 1080 doesn’t do badly. It’s not that far behind a three-way Titan X setup. 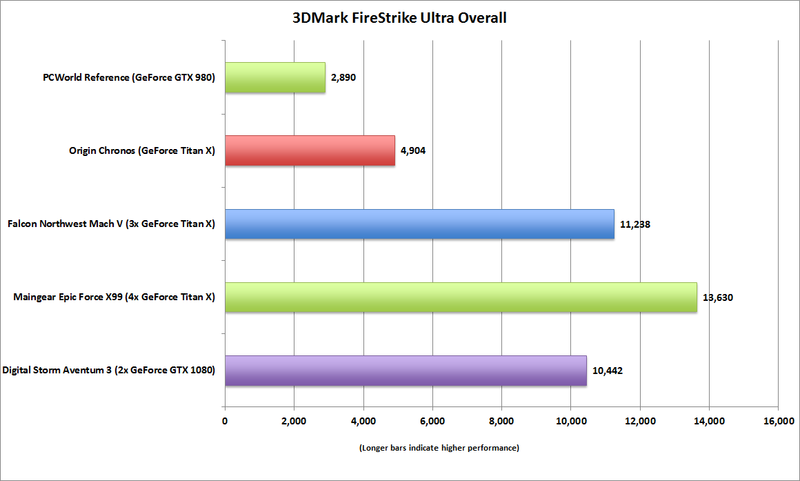 3DMark FireStrike Ultra shows the competitive race between the Aventum 3’s two 1080 cards and the Mach V’s three-way Titan X setup. 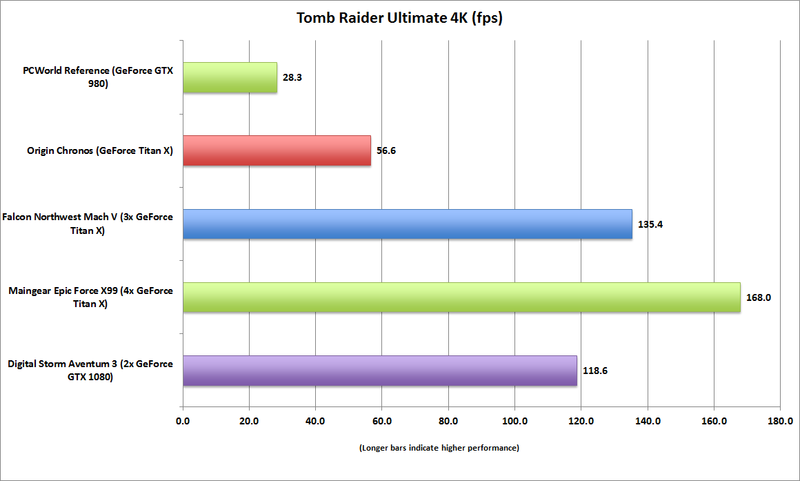 I followed up the synthetic benchmarks with an actual game benchmark: Tomb Raider, run at 4K on the Ultimate setting. This game is a couple years old and, frankly, not the graphics test it once was. Still, gaming at 3840x2160 resolution is tough, no matter the game’s vintage. The tri- and quad-SLI Titan X systems again hold a healthy advantage over the two GeForce GTX 1080 cards. 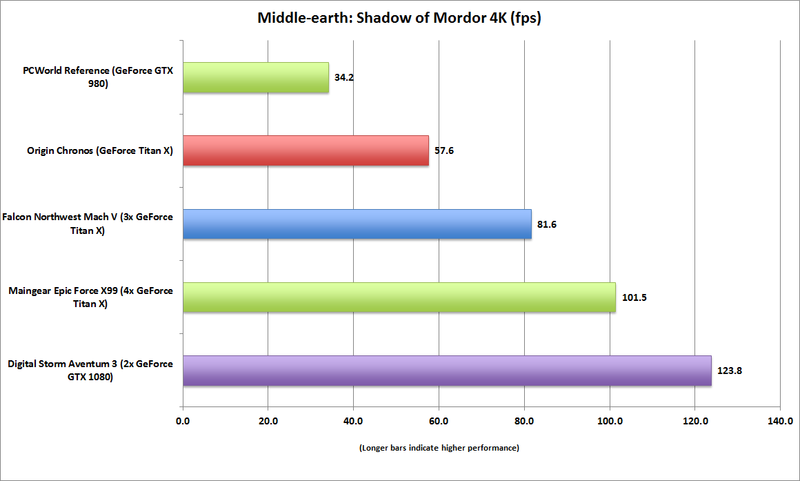 The benchmark overview ends with Middle-earth: Shadow of Mordor, which I ran at 4K resolution using the Ultra preset and the 4K texture pack. The outcome is all roses for the GeForce GTX 1080 cards. The chart below shows you just why Nvidia is having second thoughts about three- and four-way setups. While driver creep could account for some performance deficits—the Falcon was reviewed early last year, the Maingear in the middle of last year—the scaling from the Titan X cards shows diminishing returns. In other words, only certain games make it worth plunking down upwards of $1,200 for extra video cards. The Aventum 3’s GTX 1080 cards simply smoke the Titan X cards in this game’s benchmark. That’s four GeForce Titan X cards getting pounded on by two GeForce GTX 1080 cards. I haven’t mentioned price until now, because for rigs like this, that’s not usually the focus. But let’s get that issue out of the way, because anytime a system features a custom design, made-in-America manufacturing, cutting-edge components, and custom liquid-cooling, it’s assumed the price will be stratospheric. Well, you might be surprised. At $8,573, the Aventum 3’s price is high, to be sure, but not as high as you might’ve figured. The Maingear Epic Force X99 was about $11,000 with its four Titan X cards. And let’s face it, at this level, you’re also paying to make a statement with the machine. Which brings me to my main sticking point with the Aventum 3. The presentation is impressive: The paint is smooth and the performance is everything you’d expect. But the reason to have an over-the-top gaming rig is to have over-the-top GPUs. Peering through the case window of the Aventum 3 and spotting just two lonely GeForce GTX 1080 cards is disappointing. It’s like lifting up the hood of a muscle car and finding a four-cylinder engine instead of a big-block engine. This situation isn’t Digital Storm’s fault, of course. It’s Nvidia’s. That said, it’s pretty hard to justify a big, bad motherboard when half of its slots are empty. I have to give credit to Digital Storm, though. Even with just two video cards, the Aventum 3 makes for an impressive presentation. The custom case, water cooling, and performance give you plenty to humble-brag about to your friends. Is this cooling setup excessive? Maybe, but it sure looks slick.